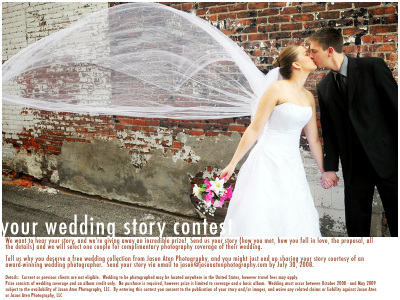 I'm really excited about this opportunity to giveaway a free wedding photography collection to one lucky couple! Check out the details below and be sure to enter by July 30, 2008! - Is there a catch? Only that you can't be a current or past customer, and you have to be getting married in the United States between October of 2008 and May of 2009 (subject to my availability). Send me your story! Give me the details you are planning of this most incredible day! - When do I find out if I won? The winner will be posted in August on the blog. - What exactly does the prize include? Complete wedding photography coverage by Jason Aten, your images on a DVD, and an Album Credit. Travel fees may apply.